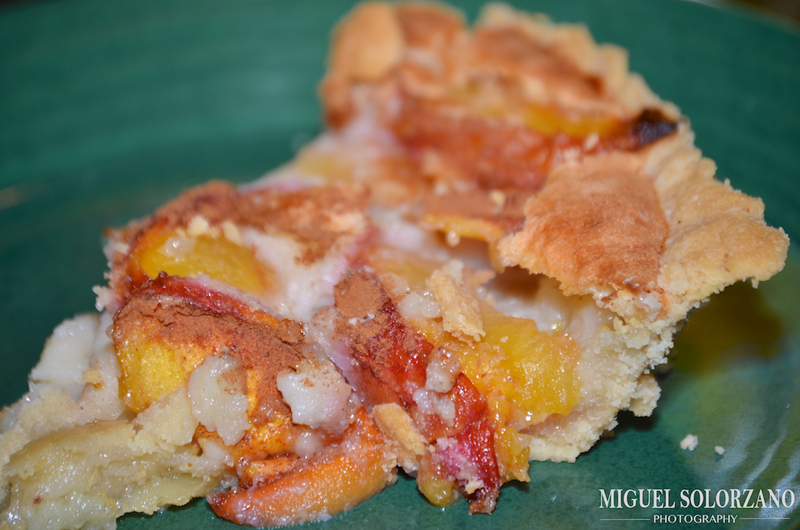 Peach Pie is a great summer dessert. What do you do when you’ve got some extra summer peaches on hand? You make peach pie. This recipe for Easy Peach Pie couldn’t be much, well, easier. It reminds of the peach pie I ate growing up when I spent many hours in the kitchen of the Mennonite family who helped raise my sister and me. Slice peaches and place in a large bowl. Toss with 1/2 cup of sugar. Let sit for 10-15 minutes. Roll out the pie dough and put into a pie dish. Fill the shell with peaches. Beat the eggs then add the flour and remaining sugar. Pour the mixture of the peaches. Pour milk over mixture and sprinkle with cinnamon. Bake 15 minutes at 450F, then 45 minutes at 350F. Turn oven off and let pie cool in oven or remove and let cool on a wire rack. This is great peach pie recipe that isn’t too sweet and really let’s the peaches take center stage. You can serve it hot or cold and garnish with ice cream or whipped cream if you want. 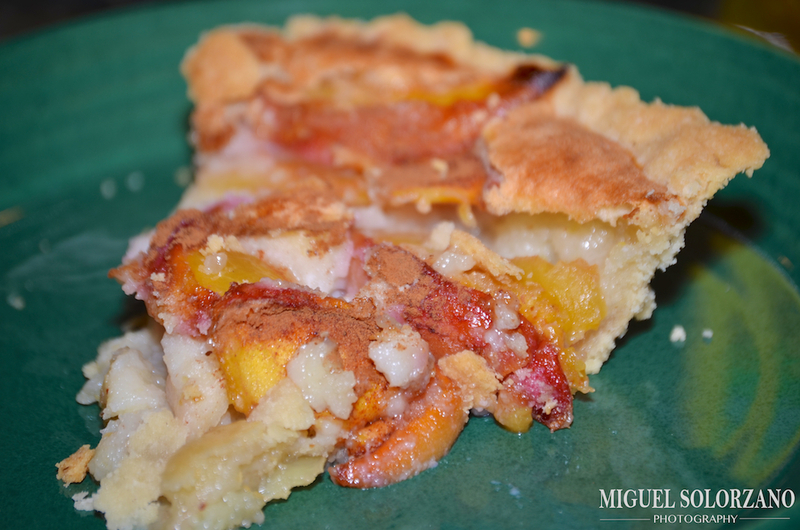 It’s summer and peaches are in season so I recommend making this Easy Peach Pie before they go out of season. Also, I highly recommend organic peaches if you can get them. I like most of my recipes, but I’m in love with this recipe. I used the fresh ingredients I got from the farmer’s market to take this pork chops to another level. Full disclosure: I used pineapple pepper jelly from the farmer’s market. However, I’m sure any regular pepper jelly will do. I highly recommend using bone-in pork chops. The flavor is really intense if you cook them with the bone in. Season pork chops with desired amount of salt and pepper.. Melt butter in a skillet with the olive oil over medium heat. Drop in pork chops and cook, turning to cook all sides evenly. Pork chops will be ready when a meat thermometer registers a temperature of at least 145F. 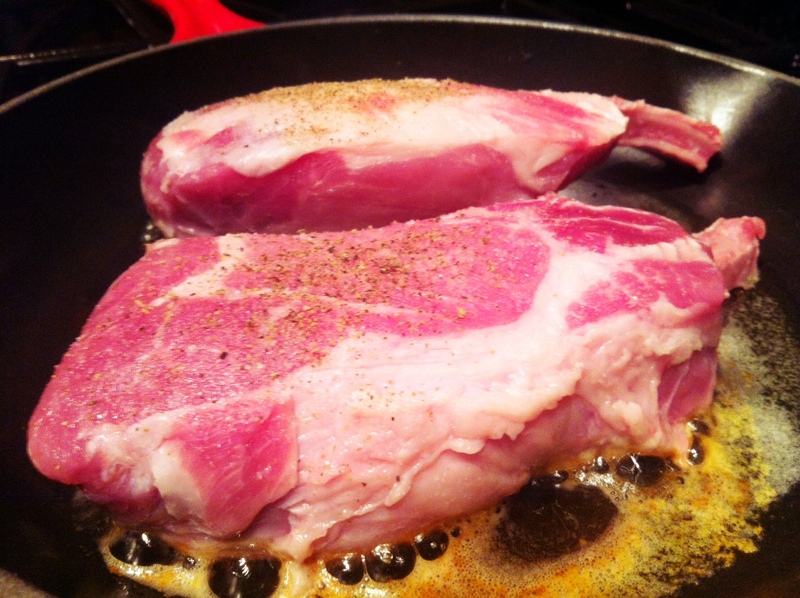 Remove pork chops from skillet and place in an oven to keep warm. 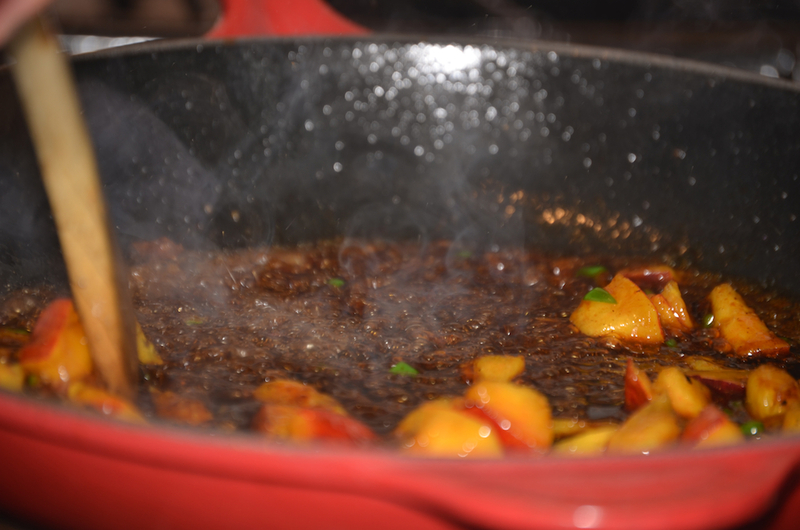 In the same skillet over medium-low heat, sauté peaches and pepper jelly until a reduction has formed. 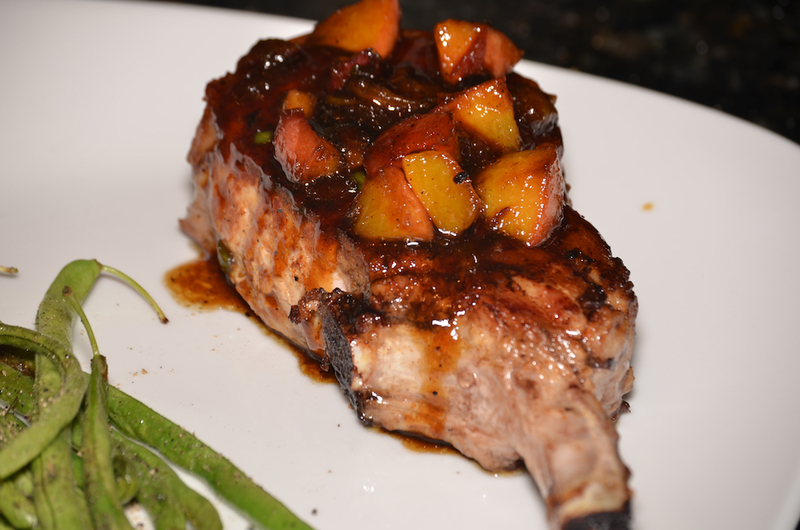 Remove pork chops from oven, plate and spoon peach-pepper jelly reduction onto each one then serve. This is a pretty easy dish with a lot of flavors. These Peach-Pepper Jelly Pork Chops are perfect for a summer dinner party. I served mine with fresh green beans from my mom’s garden. If you can find pineapple pepper jelly, use it. If not, don’t be discouraged and use whatever you can get to create this sweet heat pork chop dish. Summer’s almost here which means two of my favorite Summer fruits are coming into season. Which two? Blueberries and peaches. 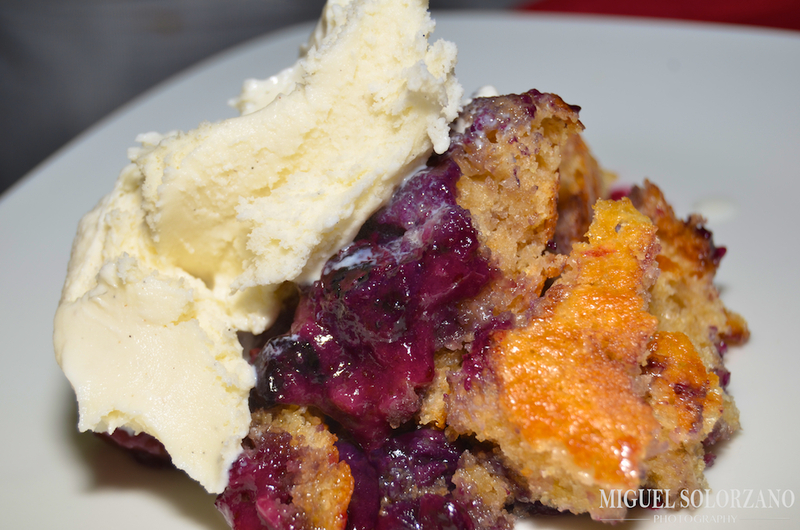 This recipe for Blueberry-Peach Cobbler combines both to create an amazing dessert. It cooks to perfection in an iron skillet, but a baking dish will do just as well. The best part is that it’s one of the easiest desserts you can possibly make. Heat the butter in a 10- or 12-inch skillet. Add blueberries, peaches and brown sugar. 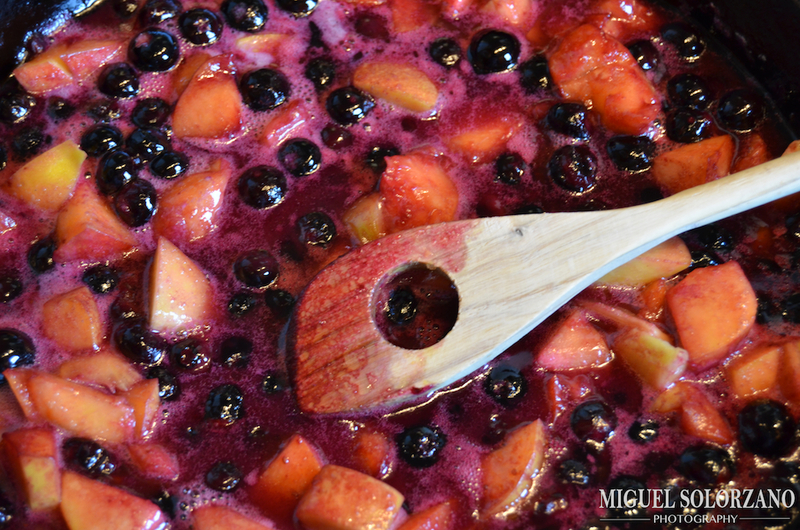 Cook, stirring gently, until berries and peaches start to soften. Meanwhile, in a medium bowl, whisk together flour, baking powder, salt and white sugar. Add milk and combine to create a batter. Spoon batter across fruit mixture evenly. You can drag a spoon through the mixture to create some blue streaks to give it a better look if you want. Bake for 20-22 minutes until fruit is bubbling and top is golden and crisp. Let cool slightly, serve and top with whipped cream or ice cream. I topped mine with some Blue Bell Vanilla Bean ice cream and it was delicious. I’m sure whipped cream is just as great. If you need to use a baking dish, just put the cooked fruit on the bottom then top with the batter. I would highly recommend using a skillet to bake it in though. 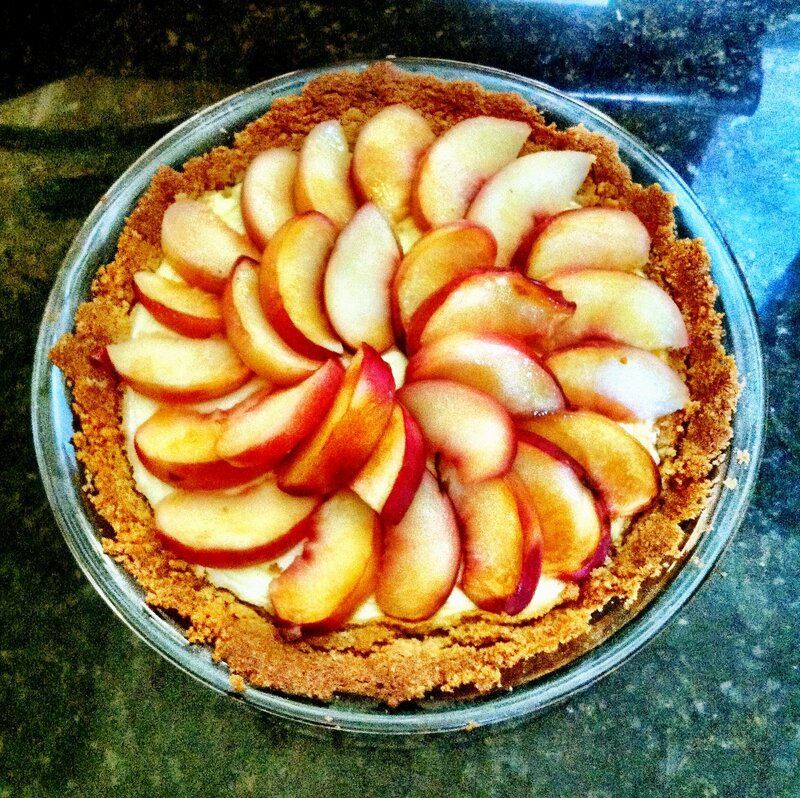 If you’re looking for a simple and cost-efficient dessert that isn’t loaded with sugar and pairs well with any fruit (though this recipe specifically calls for peaches), this tart is ideal. The hardest part is the crust. But if you’re apprehensive to make the crust from scratch, I’m sure a pre-made crust of your choosing will suffice. Preheat oven to 350F. Combine vanilla wafers with pecans, 2 tablespoons of sugar in food processor and process until fine (be carefully not to overprocess). Add melted butter and process until crumbs are moistened. 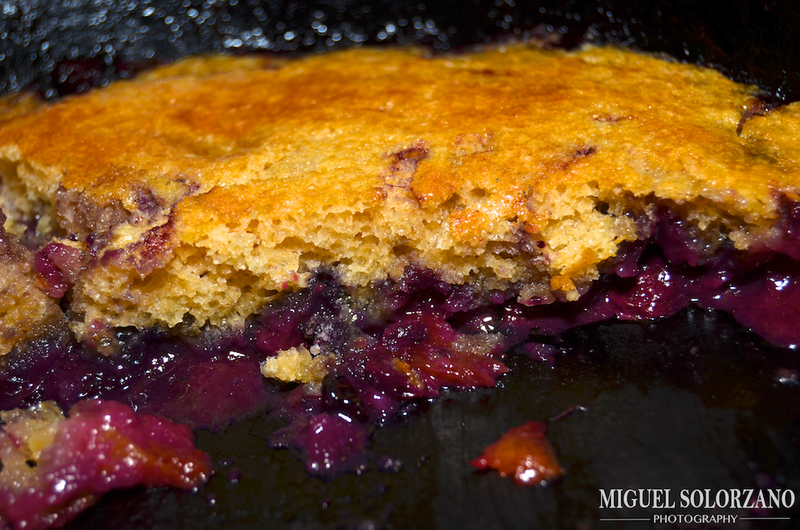 Press crumbs into 1/2 thick layer in 9-inch pan. Bake 10 minutes or until crust sets. While crust is baking, clean out food processor. Add cream cheese, Chobani plain Greek yogurt, egg and 2 tablespoons of sugar. Process until smooth. After removing crust from the oven, pour the custard into the crust and bake an additional 15 minutes until it sets. Place tart in freezer to cool, 10 to 15 minutes. In a bowl, toss peaches with remaining sugar. Arrange peaches as pictured. Cut tart into wedges and serve. This tart really does make an excellent addition to any dinner party. In lieu of peaches, I would suggest berries, bananas, or possibly mango.